I hope you all had a WONDERFUL Father's day! I know we did, What could be better then sleeping in, being late for church (oops!) Hand make cards from the kids, Presents, and eating GREAT food!!! So, as a special treat I re-made it a few days later for Father's day! Seriously...this Cake is SUPER yummy, I am a sucker for anything Almond! HERE is the recipe. I revamped mine a bit as you can see, and added more almond then it asked for in the batter! I also made this Pasta Dish for Father's Day!! Seriously...It was Soooooo Yummy!!! There were NO left overs! I am already craving it today!! Ice Cream is a HUGE tradition in our family! When I spotted this gem at Macy's, I had to get it for Brett!! He was Super excited but honestly, I think the kids were even more so!! 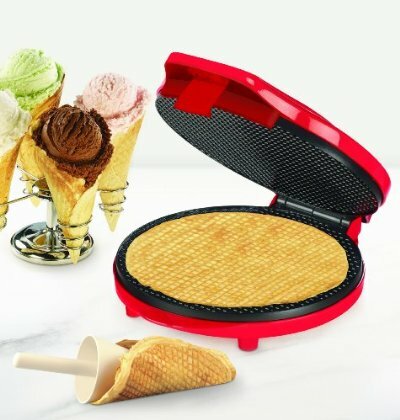 I love the waffle cone maker what a fun idea.